We were approached by our friend Sarah from Emma Magazine to style a shoot for her fall issue. We came up with a pumpkin decorating party for kids, and it was too cute not to share! This is such a fun idea for a fall birthday or an afternoon playdate, and it doesn’t have to be just for the older kiddos. With a little prep from mom and dad, your tiny tots can join in on the pumpkin decorating fun—no carving involved! We set the table with kid-friendly treats, including mummy dogs and irresistible salted caramel toffee apple dip. We also set up a small dessert table with a cute Halloween-themed cake and cake pops from Inspired Sugar. For a take home treat, we put together darling caramel apple kits. We purchased inexpensive pumpkins and painted them in advance with black chalkboard paint. We decided to use chalkboard paint because we thought that the really small kiddos would have a blast making mini masterpieces and then being able to erase them and start over! It kept the fun going with little assistance from us! A giant polka dot balloon makes an impact and is just enough decor to play off of any theme. We also chose a simple spooky cat printable banner that played into our Halloween theme. Small packets of chalk were placed at each setting, encouraging the little artists to create. Using pumpkins covered in chalkboard paint really gave the kids a feeling of independence to be creative all on their own! For little party props and imaginative play, we DIY’d some felt cat and bat masks. All of the kids had so much fun! The key to a good party at this age is simple finger foods, fun decor and crafts or activities that are age appropriate. 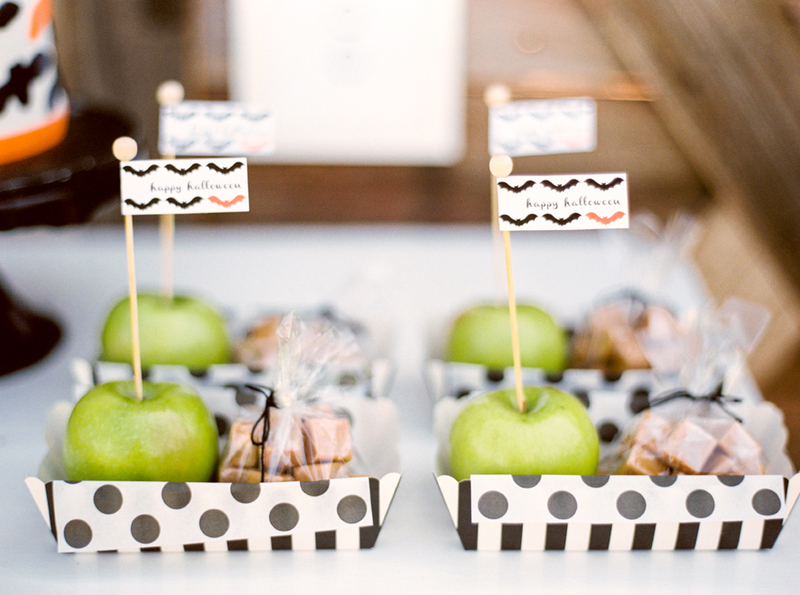 Are you planning a Halloween party with fun DIYs? Make sure to share your photos in the gallery!